Tesla Model 3 is not yet able to benefit from the CHAdeMO fast charging as the automaker did not release a CHAdeMO adapter for the compact electric car — but this is soon going to change because the Model 3 parts catalog lists a CHAdeMO as part of the set of adapters for the Model 3. Tesla made the entire car lineup’s parts catalog available to General Public a couple weeks ago in order to comply with consumer’s ‘right to repair’ policy in some stataes and making it easier on owners and technical people in handling Tesla vehicle repairs and maintenance. CHAdeMO adapter is already available for the Tesla Model S and X for a price of $450 from the Tesla online shop — Model 3 CHAdeMO adapter should cost the same as there is no difference in the charging port for North America at least. Model S and Model X cars are able to benefit from CHAdeMO fast charging of up to 62.5 kW by 500 v at 125 Amps DC but this would be an ideal situation — for real world test and analysis watch video below by Bjørn Nyland. 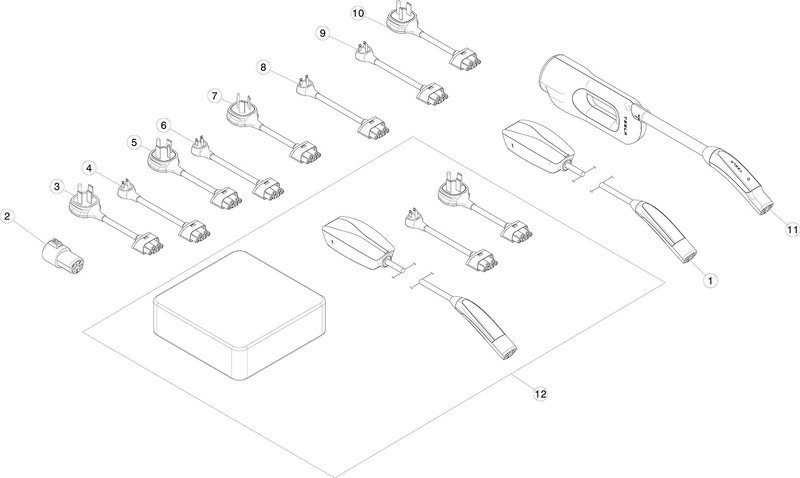 So Tesla Model 3 CHAdeMO adapter is coming soon which is confirmed by looking at the Tesla Model 3 Parts Catalog in the ‘Adapters’ section (see diagram below), the part number for the Model 3 CHAdeMO adapter is ‘CHAdEMO ADAPTER – NA / 1036392-10-D‘ — the part number is same as the Model S and X CHAdeMO adapter. However as soon as the adapter becomes available in the Tesla shop for Model 3, the car will need a firmware update to unlock the CHAdeMO charging capability. Above: Tesla Model 3 Adapters in the Parts Catalog include CHAdeMO adapter. Take advantage of the global network of DC charging stations by enabling onboard hardware and purchasing an external adapter. CHAdeMO stations enable charging at up to 150 miles of range per hour. This adapter is specifically for the North American and Japanese versions of Model S or Model X. A separate adapter is required for European, Australian, and Chinese versions of these vehicles. For Model S without Supercharging enabled, onboard hardware must be activated to use the CHAdeMO adapter. Every new Model S or Model X is already Supercharging enabled. 3rd-party billing network membership is required at many CHAdeMO stations. Access information is typically provided on the charging station. Power levels and charge rate may vary. The part number ‘CHAdEMO ADAPTER – NA / 1036392-10-D‘ contains ‘NA’ which most probably translates to North America, because charging standards and adapters slightly differ in the European countries. Last week a European Model 3 was spotted charging through a Tesla Wall Connector in Germany but with a different charging plug probably a Mennekes Type 2, dreams of a CCS charger are still at large. Video: Tesla CHAdeMO adapter explained. Thanks for the good news! If it is the same part number in the catalog as for Model S and X, why would it not work on Model 3?